A percent variance is a proportional change in an account between two reporting periods. You can calculate this in Excel with the right formula. The percent variance formula is used to calculate the difference between the values of any two periods, such as this year and last year, the variance between budgeted values and actual values and many others. To understand the working of this formula appropriately, we need to take a baseline value and a new value. After getting the difference between the baseline value and the new value, we have to divide the answer with the baseline or original value. To get the result in percentage, we format it using the percent. Assuming that the original value or baseline value is 400 and the new value is 600, the difference shall be 200. I.e. Divide the difference by the original value. 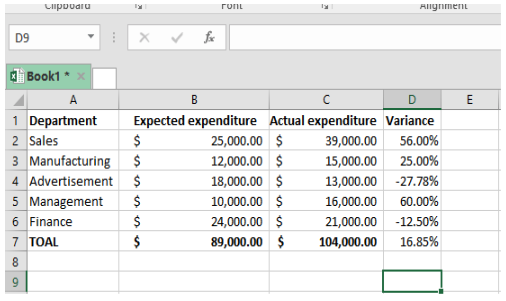 We want to calculate the percent variance between the expected expenditure and the actual expenditure in the worksheet below. In this example, we shall create another column where we shall have the variance. Let it be column D.
Then, press Enter and drag the formula down across all the other cells. This will give you the variance of each entry. Figure 3: Drag the formula across other cells to get their variance. Note that the entries in brackets in column D show a negative difference. 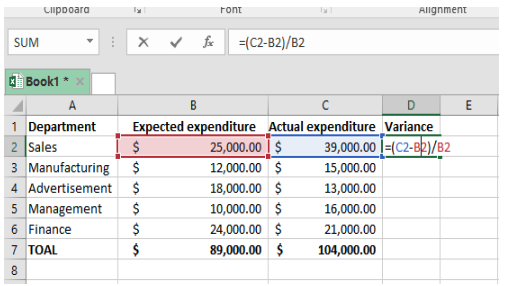 To get the percent variance, we now need to format the variance column as the percentage. This will give you the results as shown in figure 4 below. 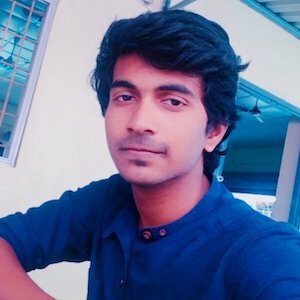 I need to calculate percent selling price and number of days on the market using structured references. When I try using "/" to divide selling price/list price, to calculate percent selling price, it doesn't work. 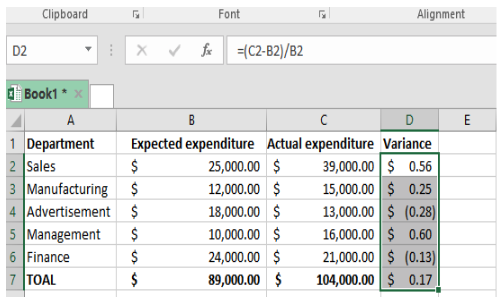 What if you have 3 columns you need to get the percentage variance on? D6 = $269,760, E6= $255,809, & F6= $291,840. 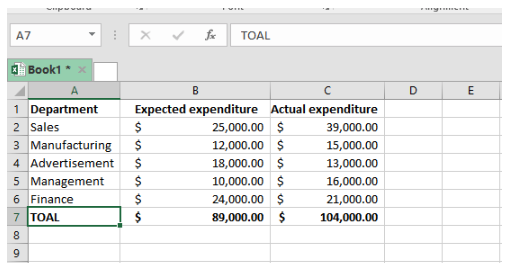 You are only showing 2 columns being used, I need to know if I just make the formula like this or if there is a different formula. my formula =(F6-E6-D6)/D6??? ?